USES: This medication is used to treat and prevent wheezing and trouble breathing caused by ongoing lung disease (e.g., asthma, emphysema, chronic bronchitis). Theophylline belongs to a class of drugs known as xanthines. It works in the airways by relaxing muscles, opening air passages to improve breathing, and decreasing the lungs' response to irritants. Controlling symptoms of breathing problems can decrease time lost from work or school. This medication does not work immediately and should not be used for sudden attacks of breathing trouble. Your doctor should prescribe a quick-relief medicine/inhaler (e.g., albuterol) for sudden attacks of shortness of breath/asthma while you are on this medication. You should always have a quick-relief inhaler with you. Consult your doctor or pharmacist for more details. HOW TO USE: Take this medication by mouth with or without food, usually once or twice daily or as directed by your doctor. If this medication upsets your stomach, you may take it with food. This medicine works best when the amount in your body is kept at a constant level. Therefore, use this drug at evenly spaced intervals. Since different manufacturers have different recommendations, check with your doctor or pharmacist about the best time(s) to take your particular brand of theophylline. Do not crush or chew this medication. Doing so can release all of the drug at once, increasing the risk of side effects. Also, do not split the tablets unless they have a score line and your doctor or pharmacist tells you to do so. Swallow the whole or split tablet without crushing or chewing. If you are taking the capsules, swallow them whole. If you are unable to swallow them, you may open the capsule and sprinkle the contents onto a spoonful of cool, soft food such as applesauce or pudding. Eat the entire mixture immediately without chewing. Then drink a full glass of liquid (8 ounces or 240 milliliters). Do not prepare a supply for future use. Dosage is based on your medical condition, response to treatment, age, weight, drug blood levels, and other drugs you may be taking. (See also Drug Interactions section.) Use this medication regularly to get the most benefit from it. To help you remember, take it at the same times each day. Inform your doctor if your condition persists or worsens. SIDE EFFECTS: Stomach pain/cramping, nausea, vomiting, diarrhea, loss of appetite, headache, trouble sleeping, irritability, restlessness, nervousness, shaking, flushing, and increased urination may occur. If any of these effects persist or worsen, tell your doctor or pharmacist promptly. Remember that your doctor has prescribed this medication because he or she has judged that the benefit to you is greater than the risk of side effects. Many people using this medication do not have serious side effects. Tell your doctor immediately if any of these unlikely but serious side effects occur: confusion, dizziness, mental/mood changes, muscle twitching/pain/tenderness, weakness, rapid breathing. Tell your doctor immediately if any of these rare but very serious side effects occur: fainting, fast/slow/irregular heartbeat, vomit that looks like coffee grounds, dark/tarry stools, seizures. A very serious allergic reaction to this drug is rare. However, seek immediate medical attention if you notice any symptoms of a serious allergic reaction, including: rash, red/scaly skin, itching/swelling (especially of the face/tongue/throat), severe dizziness, trouble breathing. This is not a complete list of possible side effects. If you notice other effects not listed above, contact your doctor or pharmacist. In the US - Call your doctor for medical advice about side effects. You may report side effects to FDA at 1-800-FDA-1088. In Canada - Call your doctor for medical advice about side effects. You may report side effects to Health Canada at 1-866-234-2345. 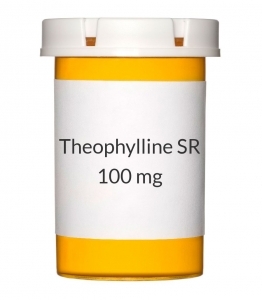 PRECAUTIONS: Before using theophylline, tell your doctor or pharmacist if you are allergic to it; or to theobromine or caffeine; or if you have any other allergies. This product may contain inactive ingredients, which can cause allergic reactions or other problems. Talk to your pharmacist for more details. Before using this medication, tell your doctor or pharmacist your medical history, especially of: a certain breathing disorder (cystic fibrosis), glaucoma, diabetes, heart problems (e.g., congestive heart failure, irregular heartbeat), high blood pressure, kidney disease, liver disease (e.g., cirrhosis), seizures, stomach/intestinal ulcer, thyroid disease. This drug may make you dizzy. Do not drive, use machinery, or do any activity that requires alertness until you are sure you can perform such activities safely. Limit alcoholic beverages. If you develop a fever/flu-like symptoms while taking this medication, tell your doctor promptly. The dose of your medicine may need to be adjusted. Before having surgery, tell your doctor or dentist that you are using this medication. Caution is advised when using this drug in the elderly because they may be more sensitive to its effects. Careful monitoring of side effects and drug blood levels is recommended. Caution is advised when using this drug in children because they may be more sensitive to its effects. Careful monitoring of side effects, drug blood levels, and dose adjustment is recommended. During pregnancy, this medication should be used only when clearly needed. Discuss the risks and benefits with your doctor. Changes in your body during the last 3 months of pregnancy may affect the amount of this drug in your blood. Your doctor should carefully monitor the amount of drug in your blood, as well as any side effects, so that your dose may be changed if needed. This drug passes into breast milk and may have undesirable effects on a nursing infant (e.g., irritability). Consult your doctor before breast-feeding. DRUG INTERACTIONS: Your doctor or pharmacist may already be aware of any possible drug interactions and may be monitoring you for them. Do not start, stop, or change the dosage of any medicine before checking with your doctor or pharmacist first. Before using this medication, tell your doctor or pharmacist of all prescription and nonprescription/herbal products you may use, especially of: adenosine, adrenaline-like drugs (e.g., ephedrine, phenylephrine, pseudoephedrine), allopurinol, aminoglutethimide, certain antiarrhythmic drugs (e.g., mexiletine, propafenone), anti-seizure drugs (e.g., carbamazepine, phenytoin, phenobarbital), benzodiazepines (e.g., diazepam, flurazepam), certain beta blockers (e.g., propranolol), birth control pills, cimetidine, digoxin, disulfiram, fluvoxamine, interferon, macrolide antibiotics (e.g., erythromycin, clarithromycin), isoproterenol, lithium, methotrexate, moricizine, pentoxifylline, rifampin, St John's wort, sulfinpyrazone, tacrine, thiabendazole, ticlopidine, verapamil, zileuton. Check the labels on all your medicines (e.g., cough-and-cold products, diet aids) because they may contain ingredients that could increase the side effects of this medication. Ask your pharmacist about using those products safely. Tobacco/marijuana smoking decreases blood levels of this medication. Tell your doctor if you smoke or have recently stopped smoking. Your dose of medication may need to be adjusted. Caffeine and alcohol can increase the side effects of this medication. Avoid drinking large amounts of beverages containing alcohol or caffeine (e.g., coffee, tea, colas), or eating large amounts of chocolate. Certain diets (high protein/low carbohydrate or high carbohydrate/low protein) may change the effect of theophylline. Tell your doctor if you are following a dietary plan or eat beef every day. The dose of your medicine may need to be adjusted. This medication may interfere with certain laboratory tests (e.g., blood sugar, cholesterol, uric acid, dipyridamole-thallium imaging tests), possibly causing false test results. Make sure laboratory personnel and all your doctors know you use this drug. Laboratory tests for drug blood levels may be affected by other drugs/foods, possibly causing false test results. Tell all your doctors and laboratory personnel if you use any of the following products: caffeine, theobromine, chocolate, furosemide, sulfathiazole, phenylbutazone, probenecid, acetaminophen, cefazolin, cephalothin. This document does not contain all possible interactions. Therefore, before using this product, tell your doctor or pharmacist of all the products you use. Keep a list of all your medications with you, and share the list with your doctor and pharmacist. OVERDOSE: Symptoms of overdose can occur at usual prescribed dosages of theophylline. If overdose is suspected, contact your local poison control center or emergency room immediately. US residents can call the US National Poison Hotline at 1-800-222-1222. Canada residents can call a provincial poison control center. Symptoms of overdose may include: agitation, nausea, frequent vomiting, trouble sleeping, unusual thirst, fever, ringing in the ears, seeing flashes of light, fast/irregular heartbeat, seizures, confusion, chest pain. NOTES: Do not share this medication with others. Laboratory and/or medical tests (e.g., theophylline blood levels) should be performed periodically to monitor your progress or check for side effects. It is important that you do not miss your medication or take extra doses for 2-3 days before your theophylline blood levels are checked. Consult your doctor for more details.